As instructed, after an expedited breakfast in another courtyard of the hotel, we checked out an ready at 7:30 in the lobby. Our mini bus shows almost one hour later, but the poor driver comes all the way from Kuala Lumpur to pick us up, and he is now driving back in the direction he came with us in tow now. Again the expense of the palm plantations is incredible. Lukily sometimes there are mountains covered with jungle to break the pattern, but soon we find ourselves sleeping again. We were supposed to stop at an elephant sanctuary, but this activity can’t take place because it rained too much during the night. We don’t regret, having done that already in Thailand. 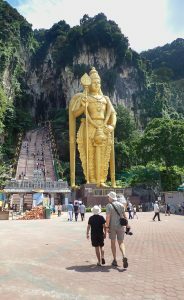 Instead we get to visit the Batu Caves just outside Kuala Lumpur. 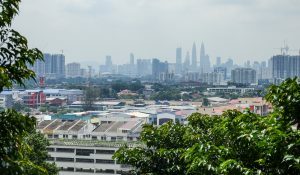 Sandra is thrilled to see the KL skyline with the famous Petronas towers. Our driver tells us to take our time for the visit, he needs a good rest. It’s very hot but there are not that many people on the site. We are at the bottom of limestone cliffs poked with caves. A gigantic statue of an Indian Buda guards stairs leading up to a large cave entrance. 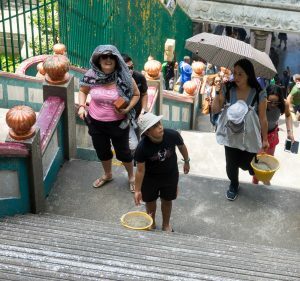 There are signs asking visitors and worshipers to bring up either a brick or a pail of sand upstairs. We do our bit and climb loaded. The cave is swarming with monkeys who are trying to grab anything that is sticking out from people. 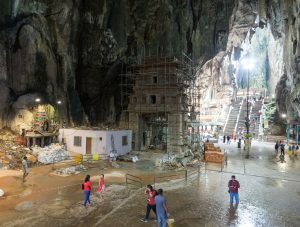 Up in the massive cave, men are actively working on a new temple and there is a massive pile of sand and it’s quite incredible considering it has been hauled little by little in the small sand pails. It’s time we head back to the car to carry on our journey. 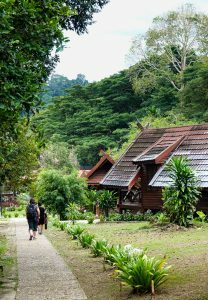 The scenery is still hills with jungle and then kampungs with plantations, including rubber trees, but mostly palms, palms, palms… We stop at a petrol station for lunch, and end up eating KFC Malaysian style. Sandra gets Savadee Chicken: the batter is spiked with thaï spices, it’s quite good. Funnily it comes with mashed potatoes with gravy. The boys go for fried chicken burgers. 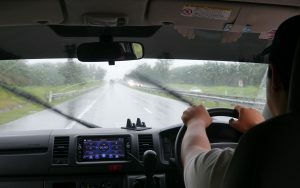 As we reach Jerantut, it starts to rain big time. Luckily upon arrival at Mutiara, the rain has stopped for our 1 Ringgit per person boat crossing. 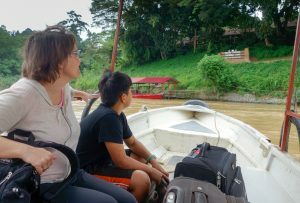 At the Mutiara docking, we put our suitcases in a cable wagon before climbing the embankment to the reception area. Ryo is then brought on a golf cart together with our luggage to our wooden hut number 92 which is quite a hike away. The rooms are comfortable but it’s time for apéro and also we have to buy our park permits. So after freshening up, we head to the ranger station then to the restaurant and order cocktails and beer. Dinner is included in our package and it’s a buffet. The food is decent if not super gastronomic. During our meal it starts pouring rain again and we get seriously wet to get back to our hut. Still we bundle ourselves in our rain jackets and take the umbrellas available in the room to present ourselves for the scheduled night walk in the jungle only to learn that it has been cancelled because of the rain. 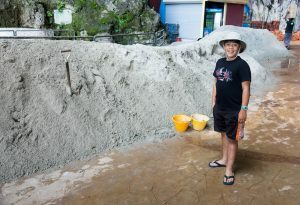 We are not too unhappy about this as despite having not done much of exercise during the day except bringing up a pail of sand up the Batu cave stairs, we are exhausted.